Shabby Chic & Modern Chalk Board Appearance for use with Liquid Chalk Markers or Regular Chalk. This Chalk Board Hanging Sign is perfect for menu or promotional messages for restaurants, kitchens, bars, cafes, stores, weddings & special events. 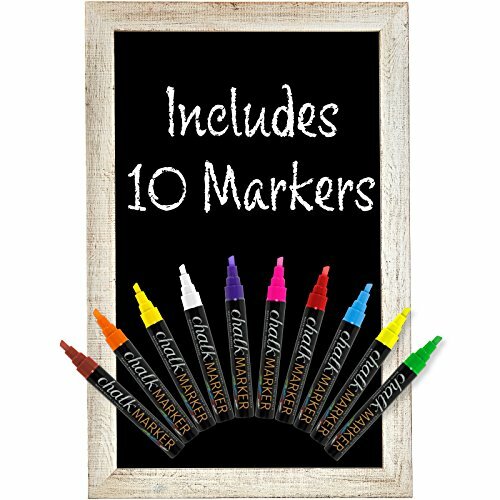 INCREDIBLE VALUE: This decorative framed chalkboard comes with 10 Liquid Chalk Markers (a $15 value) along with traditional chalk and eraser. You can begin using it right out of the box! LARGE SIZE: The outside frame is 20"x30" and the writing surface is 16"x25.5"
GUARANTEED QUALITY & BUILT TO LAST: Ships and Services by Amazon with Prime available A-Z money back guarantee. High quality heavy-duty and BUILT TO LAST! Made by Excello Global Products. We are a family owned USA company and we have been making quality products for over 50 years. SATISFACTION GUARANTEED OR YOUR MONEY BACK - NO QUESTIONS ASKED! If you have any questions about this product by Excello Global Products, contact us by completing and submitting the form below. If you are looking for a specif part number, please include it with your message. Metla Sunflower Welcome Decorative sign 17"X10"